At Glenbrook, we believe in large amounts of time for free play each day—both inside and outside. We provide a child-size world in which we give children experiences with people, experiences with social customs that relate to care and maintenance of body and possessions, and experiences that extend children’s understanding of the world and their place in time and space. Each preschool class follows a slightly different routine; however, each day is made up of the same components, allowing the children to feel a sense of routine and community. Free play, art, clean-up time, bathroom/washing hands, snack, circle time, and outdoor play are all critical components of our school day. “Special” activities take place during the school year, too: a weekly music program provides the children with an opportunity to sing, engage in movement activities and to develop an awareness of and appreciation for all types of music. Every year the calendar includes special events at the school such as a puppet show or petting zoo animals. Field trips to Bethesda Fire Station 26 or the nearby Locust Grove Nature Center are also part of the school year. The unique skills of the parents—from juggling to playing the guitar to decorating cookies—are introduced at various points of the year, exposing the children (and parents alike) to a host of different experiences. Once the school year is underway, each child rotates through appropriate “jobs” to assist in accomplishing specific tasks; those jobs become part of their daily routine. 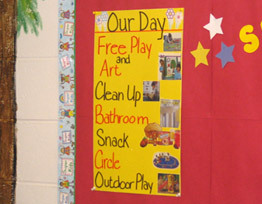 Leading the line to the bathroom or playground, passing out cups and napkins, ringing the clean-up bell, watering plants, and feeding the hamster are all important to building the child’s sense of belonging and their responsibility to their classroom community.